It's that time of year again when the soon-to-be three-year-old Thoroughbreds start their campaign for the 2019 Kentucky Derby and dream of the elusive Triple Crown. Until mid-April, there will be a prep race somewhere every weekend from now on until the Kentucky Derby on the first Saturday in May. Keep checking back with this list as I will post results and links to recaps or stakes histories for all the races weekly. Only races which earn points toward getting in the Kentucky Derby field are included. 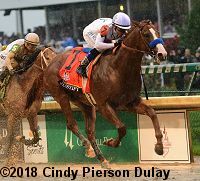 You may also want to check the Road to the Kentucky Derby Leaderboard since the points earned by contenders are what will determine who gets in the Kentucky Derby at entry time this year. * - race dates and distances to be announced by host track; date based on recent historical placement.